Encourage intergenerational interaction with these activities. Did you know that September is Intergenerational Awareness Month? It's a global movement that celebrates the benefits of intergenerational relationships while bringing awareness to the importance of closing the gap between generations. Rita Altman, senior vice president of memory care and program services at Sunrise, believes intergenerational interaction is critical, as it can strengthen bonds and unite older adults and younger people on a new level. Older people can offer guidance and friendship for young people, and also reap the rewards of spending time with family and socializing. Use resources like Ancestry.com to go through the family tree together. You and your loved ones can get a better understanding of where you came from and who your ancestors are. "A game of cards will teach children important social and mental skills." Have your parents teach the young kids in the family how to play their favorite card game. This is a great way to get the family together, but it also teaches children important social and mental skills, according to Parent & Child magazine. Or, consider trying an interactive game on a tablet or game console. This may allow the younger generation the chance to teach the older adults a thing or two. Gardening is a great way for older adults to pass on knowledge, tradition and skills to the kids in the family, according to Generations United. It's a fun activity that encourages everyone to care for the environment, make healthy food choices and work together as a team. Get the family together in the kitchen to prepare dinner. 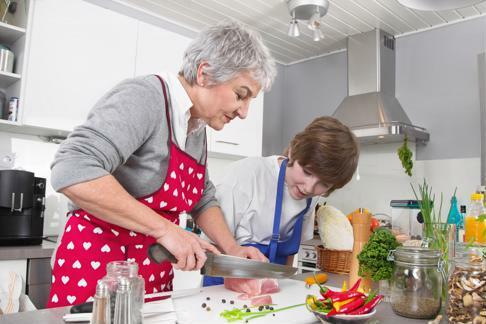 Cooking and eating are social activities that can bring people of all ages together with ease. Ask one of your parents to bring a favorite recipe to the get-together. Then, he or she can pass it along to your children so the meal stays in the family for generations to come. Get the whole family together in the kitchen to cook dinner. Everyone perceives art, natural history and music differently. Taking a trip to a museum can educate your family members and encourage them to discuss likes and dislikes, which may lead to discovering commonalities that were never addressed before. Volunteering teaches children useful skills and it's a meaningful way for the entire family to give back to the community. It allows the older generations to understand how the younger children thrive in social situations, and vice versa. Throughout Intergenerational Awareness Month and beyond, do your best to coordinate more time for the family to spend together.